Don't make the mistake of overestimating how much ground the stock market has gained. The Dow Jones Industrials (DJINDICES:^DJI) hit their highest closing level ever today, rising more than 25 points and coming within spitting distance of the 17,000 mark. For more than a year now, investors in the Dow have seen record levels come on a regular basis, and it's easy to conclude that stock market participants are all getting rich. But at least so far this year, the records for the Dow Jones Industrials have been misleading, and so you shouldn't get too excited about all the talk of Dow records. 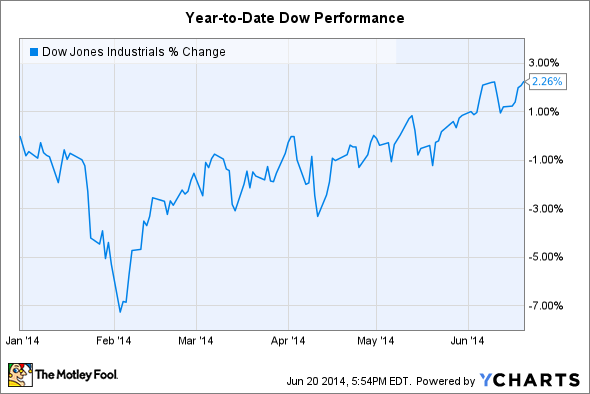 Friday marked the Dow's 11th record close of 2014. That leaves the Dow well short of its record performance in 2013, when it hit new all-time highs on 52 separate trading days -- once a week, on average. What's more surprising, though, is the disparity between the Dow's overall return in 2013 and its year-to-date return so far this year. The Dow jumped more than 26% last year, amounting to roughly a half-percentage point gain for every record close for the average. Extrapolating based on this year's number of records, you'd expect to have seen the Dow rise by at least 5% to 6%. Moreover, unlike in 2013, the Dow actually started 2014 at record levels, with the prior year's Dec. 31 close having marked a high-water mark for the Dow for the first four months of the year. By contrast, the Dow started 2013 substantially below its former record levels from 2007, forcing it to play catch-up for the first couple months of the year. The reason is pretty simple: many of the Dow's record runs have made only minimal progress over past levels. Today's record, for instance, added just over a single point to its level 10 days before. That record in turn was less than three points higher than the previous day. In all, four of the Dow's 11 records have been by five points or less, and just one has pushed the record level up by more than 100 points. Dow records capture headlines, but they don't always spell big returns for investors. Before you assume that you can expect to see big gains in your quarterly brokerage statement, be sure to look at the actual level of the Dow Jones Industrials and other stock market benchmarks. That way, you won't be disappointed when records turn out to be much less meaningful than you'd expect.